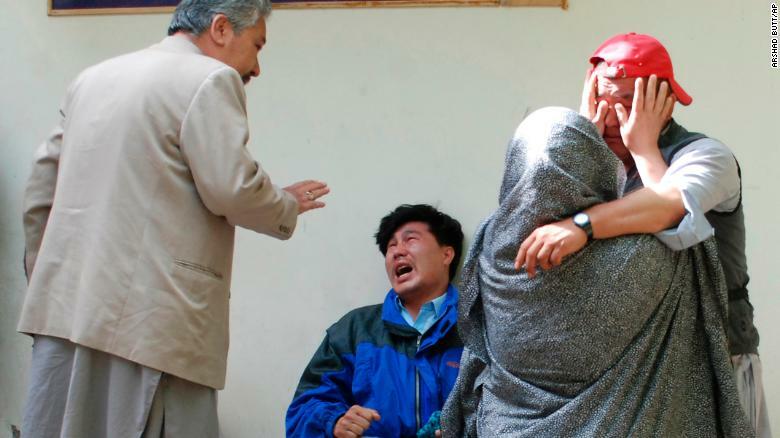 The attack hit the city’s Hazarganji district, which is home to a large community from the Hazara Shia Muslim minority, Quetta’s Deputy Inspector General of Police, Razzaq Cheema, told CNN. At least seven Hazara were among the dead, along with one security official, Cheema said. Family members of the blast victims comfort each other outside a mortuary in Quetta, Pakistan, after bomb went off at an open-air market in the southwestern city. In a news conference, Ziaullah Langove, home minister for Balochistan, said it was a suicide attack, confirmed the death toll and added that as many as 48 people were injured. Lashkar-e-Jhangvi, a Sunni militant group known to target the Hazara community, said it carried out the bombing. Quetta, the capital of Pakistan’s restive southwestern province of Balochistan, is often targeted by militants, although this was the first such attack this year. “We will not bow before terrorists,” Balochistan’s chief minister, Jam Kamal, said in a statement shortly after the bombing. In December 2017, a suicide bomber attacked a church packed with worshipers, leaving seven people dead. Just months later, another bomber attacked police and troops in the city, killing six officers and injuring eight. In July last year, 149 people were killed and 186 injured in a suicide attack in the Mastung area south of Quetta, which targeted the convoy of a political candidate. ISIS claimed responsibility for that bombing, the second deadliest terror attack in Pakistan’s history.